Cala San Vincente (also known as Cala Sant Vicenç) is a lovely, small holiday resort set in what is still essentially a fishing village. Situated on the northeastern coast, about three miles (5km) from Pollensa, Cala San Vincente boasts spectacular scenery, charming old houses and three beaches. This is not the place to come for all-night parties or massive hotel complexes, but suits those seeking to relax and enjoy the character of the area. It is especially suited to mature travellers and those with older children, as there isn't much on offer for young kids or twentysomethings looking for a party. The main beach is Cala Barques, where holidaymakers can expect to share the space with local fishermen repairing nets, as well as their equipment, and there are also several beachside restaurants and bars on offer. Tucked around a rocky hillock is the tiny and often crowded Cala Clara beach. A little bit further on is the popular swimming beach of Cala Molins, whose sand is imported each year. In general, the water is warm and crystal clear, perfect for swimmers, and the views are spectacular. There is not much in the way of shopping on offer in Cala San Vincente besides the basics, but the nearby town of Pollensa offers a greater selection and a lovely Sunday market, as well as several historic buildings. There are also regular buses to Inca and Puerto Pollensa. 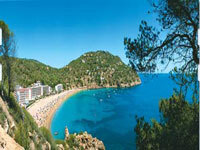 Cala San Vincente is one of the smallest resorts on the island and also one of the most resiliently authentic. Tourism doesn't seem to have had much of an impact on the village and the selection of restaurants is not impressive. However, there are some charming local eateries and seafood restaurants, and some of the hotels have good restaurants. There is no nightlife to write home about, and after-dark entertainment is mainly limited to drinks and dinner. This tranquil atmosphere will delight some but won't suit those in search of a party. The beaches are the centre of attention for visitors, with the more developed resorts nearby offering some more lovely stretches of sand and a few other entertainment options. A popular local attraction is a series of prehistoric man-made caves, and closer to Pollensa are the Calvari steps: 365 tree-lined steps that lead up to the minute Calvari church and its ancient wooden cross. For the less culturally inclined, a mini golf course is also on offer. Cala San Vinvente offers little in the way of amenities for children. There are few places to shop without going to neighbouring resorts.